The crisp air and smell of the ponderosa pines give a distinctive feeling to this 385-acre regional park. 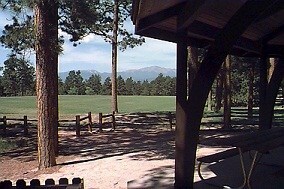 There are spectacular views of Pikes Peak and the Front Range. The developed area, with turf playfields, tennis courts, playground, and two picnic pavilions were created in natural openings of the forest.